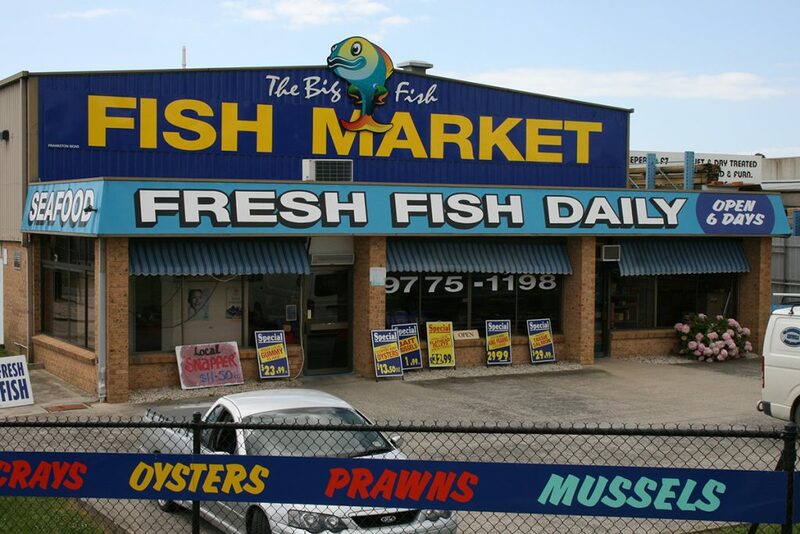 Located in Carrum Downs, just a few minutes from Eastlink, Peninsula Link, and the Frankston Freeway, The Big Fish, Fish Market specializes in supplying fresh Australian seafood direct to the public. When you’re craving for some great local seafood, there’s no better place than The Big Fish, Fish Market. We have all the fish and seafood that you could ever want, whether you are looking to buy a whole fish, prepared fish fillets or some scrumptious seafood. Whichever product you are after, we guarantee that our daily range of fresh fish will delight you just like the many happy customers who have kindly added a review and liked our Facebook page to keep up to date with our latest seasonal offers. Mex Hunt has been involved in the shop for 30 years. Sons Pete and Tom, began helping in the family owned fish market whilst studying throughout their school years including on weekends & school holidays. When they finished their schooling, both young men started working in a full time capacity, gaining invaluable experience in filleting & processing, managing retail & wholesale sales as well as production. With a growing passion to continue in their father’s footsteps and build on the traditional seafood market, they proudly took over the helm in mid 2011 when The Big Fish, Fish Market was born. Having spent their lives in and around the seafood industry, both brothers now own and operate The Big Fish, Fish Market. Between them, they have a lifetime of experience and great knowledge of all things seafood. ‘We love fish and we want to share our love for the sea with you! Some of the fresh fish we offer include Rainbow Trout, Snapper, Tasmanian Atlantic Salmon, Yellowfin Tuna, Flathead, King George Whiting and more. We also stock a wide variety of shellfish and crustaceans. In fact, we’ve got everything, from seasonal cooked Tassie Lobsters to fresh South Australian Oysters sourced from Coffin Bay, Streaky Bay and Franklin Harbour. Eating fresh fish is recommended as part of a healthy diet. Buying the freshest fish available that is locally sourced is even better. In fact, fresh fish is part of Nutrition Australia’s Healthy Eating Pyramid. It’s tasty and healthier than most proteins available today. Fish is rich in various vitamins and minerals necessary for the body to function properly. These include vitamin A, B vitamins and vitamin D. Fresh fish is recognised as an excellent source of omega-3 fatty acids. They’re great for maintaining a healthy heart and also known for supporting good brain health. These are just a couple of good reasons why you should add fresh fish and seafood regularly to your diet. Don’t Have Time to Prepare Your Fish? The Big Fish, Fish Market has a wide range of gourmet seafood products prepared using home-style recipes you will love. For a quick healthy meal, just try some of our Cajun spiced Barramundi kebabs, Thai fish cakes, seafood marinara, Garlic Prawns and more. Prepare any of these delicious meals for the family or serve up a storm to guests at your next dinner party. Come & check out our huge range of fresh fish & seafood – you won’t be disappointed. Visit us at 2 Aster Avenue, Carrum Downs today. Need to know if we’ve got your favourite type of fish in stock? Just give us a call on 03 9775 1198 or contact us here!